Machu Picchu is one of the most iconic sights in South America, and the culmination of our magnificent Inca Trail trek through the Peruvian Andes. Join us as we trek this breathtakingly beautiful route through valleys and high passes, scattered with fascinating Inca ruins. Trekking on Inca-paved paths and steps, our route takes us up through lush cloudforest to the demanding Dead Woman’s Pass (4200m). Continually climbing up or dropping down, our way is steep at times, and the altitude adds to the challenge. We finally come to the Sun Gate, which overlooks Machu Picchu, where your first magical glimpse provides an unforgettable reward for your efforts. Each year, the Peruvian Government release a limited number of trekking permits for the upcoming 12 months. Permits for April - October departures (peak trekking season) sell out extremely quickly and demand for these permits increases year on year. Permits will be released in October for the following year's departures. To avoid disappointment and in order for Discover Adventure to secure your permit, you will need to book your place early for this challenge. Morning arrival in Cuzco (3400m); transfer to our downtown hotel. After a trip briefing, the afternoon is free to explore the sites of this historic city, or simply adjust to the altitude by watching the world go by in one of the numerous cafés on the Plaza de Armas. Night hotel. Our first day’s trek takes us from Tambo Machay, an ancient ruin high in the hills above Cuzco. We pass some of the amazing Inca sites in the surrounding country-side as we walk downhill to Sacsayhuaman, the huge and impressive Inca ruin on the outskirts of Cuzco. As well as beautiful scenery and fascinating ruins, today’s trekking offers excellent acclimatisation to the altitude. Night hotel. After a second night at altitude we should all be feeling ready for action! We leave Cuzco behind us, heading out along the Sacred Valley via Ollantaytambo to the Trail’s starting-point at Km82. The first half-day walk is fairly easy and on an undulating path which follows the Urubamba River for much of the way. After lunch a gentle climb takes us to our camp at Wayllabamba. There are a couple of steep drops and climbs into gullies along the way, with great views of Mt Veronica standing at 5000m. We pass a couple of small places to buy cokes. The path is dusty but firm and there are no steps. Night camp (3000m). Today we have the big climb – rising from camp all the way to Dead Woman’s Pass at 4200m. This is a relentless and steep climb on narrow trails, first through grassland, then cloud forest (where some people start to feel the altitude), where the path is steeper and can be muddy. Eventually it opens out onto pasture where we will have lunch with snow-capped mountains behind us and a distant view up to the top of the pass, still several hours ahead. The final stretch to the top of the pass is well maintained with steps but the pace is slow because of the altitude. From the top we descend on steps to our evening's campsite at Pacamayo, below the ruins of Runkurakay. Night camp (3500m). Now on the Inca Trail proper, the path is mostly steps which are steep in places and there are ruins every mile or so along the way. We have our second high pass at 4000m, again with steps leading up to the top and down the other side. The descent takes around an hour to Sayacmarca ruin (3600m), which is perched above more steps. From here the trail is very pretty, wide and easy-going with interesting fragments of cloud forest en route. The third pass is reached easily after passing through an Inca tunnel in the rock and a gentle climb. We continue on to the ruins of Puyupatamarca and then descend steep steps to our campsite at Winay Wayna. Night camp (2640m). We start early and have a three hour walk to Inti Punku, the Sun Gate, along a beautiful stretch of trail, scattered with ruins and some steep flights of steps, with a few large drops down the side to the Urubamba River. We should arrive at Machu Picchu before the crowds arrive from Cuzco. We enjoy a guided tour around this extraordinary site, before meeting up in Aguas Calientes. In the afternoon we take the train back to Ollantaytambo and return to Cuzco by bus. Night hotel. After a good night’s sleep and a relaxing lie-in we have the remainder of the day free to explore Cuzco or do any last-minute shopping. Those looking for an adrenaline fix may wish to pre-book on to a White Water Rafting Activity (see extensions for details). Later this evening we all meet up again for dinner to celebrate our achievements. Night hotel. The Amazon rainforest is legendary throughout the world as an ecosystem rich in vegetation, wildlife and indigenous culture, and one which is currently under constant threat from mankind. The River Amazon’s source is in Peru, and the river carries around 20% of the world’s fresh water. The rainforest covers almost half of Peru and extends into 9 other South American countries. It contains approximately 50,000 species of higher plants – a staggering twenty percent of the world’s total. The tree canopy is so dense that almost no sunlight penetrates to the forest floor and there is very little undergrowth. Animal and bird life is incredibly rich, including colourful macaws and toucans, several species of monkey and the rare tapir, jaguar and Andean spectacled bear. Giant otters, caimans, capybara and piranha live in the many waterways. This is your chance to experience the amazing diversity of flora and fauna set in part of the most famous and awe-inspiring rainforest in the world! We travel by plane and then river boat to our lodge on the banks of the Tambopata River, and explore the trails and waterways on foot and by boat. This isn’t a luxury experience, but it’s an unforgettable adventure in a unique and threatened world. Following on from Lake Titicaca (see below), we then move on to the magnificent Colca Canyon, the deepest canyon in the world, where we immerse ourselves in jaw-dropping scenery and fascinating small towns. We also have time to stop at Cruz del Condor, the famous observation point, to marvel at condors flying breathtakingly close – likely to be one of your top highlights from Peru! Those with less time can fly to Lima after their time on Lake Titicaca (please refer to the below option). Lake Titicaca is the highest navigable lake in the world, lying on the high altiplano at 3856m above sea level, straddling the Peru-Bolivian border. It is home to the legendary Uros Islands – floating reed islands where the Uros people have lived for centuries. We visit Amantani Island, with its mountaintop temples to Pachamama and Pachatata (earth mother and father), and stay overnight with local families. We then move on to Taquile, famous for its intricate, brightly-coloured weaving. The lake views are fabulous, but the highlight of the trip is the glimpse into the everyday lives of the local people, from cultures pre-dating the Incas by a thousand years. Those with less time or not wishing to continue to the Colca Canyon will transfer from Puno to the airport at Juliaca (approx. 45 mins) for the flight to Lima; connect with international flight to UK (arriving Day 5). Please refer to the above itinerary for more details on this extension to include the Colca Canyon. Anyone looking for a fun day of alternative adventure should try this great white-water rafting trip, which takes you down a beautiful section of the Urubamba. Rafting is a fun sport, suitable for all ages – no experience necessary! The Urubamba River rises in the Andes and flows through the heartland of the former Inca Empire. The section we run is usually the Class III-IV Chuquicahuana section located above Cuzco, where a gentle start allows us to practise our technique before the river takes us through a beautiful canyon with views of the surrounding peaks and fun, adrenaline-pumping rapids. Rafting is a participatory team event, so your paddle is not just for decoration! Beware: you will get wet! This day-trip takes place on Day 8 of your main trekking itinerary (in place of the free day in Cuzco); you will get back to the hotel mid-to-late afternoon. Requires a minimum of 4 people to run. Please contact us for more details. 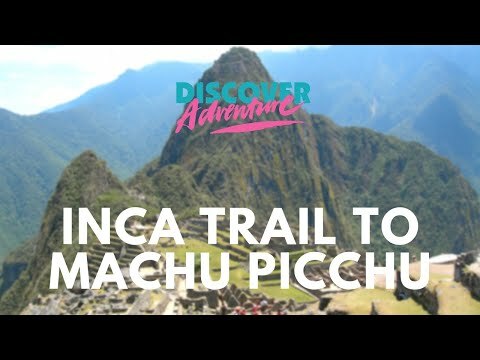 Fantastic time on the Inca Trail challenge to Machu Picchu. The travel, hotel, food, camping, trail...everything was amazing. Well done DA, my first challenge of this sort and definitely won't be my last! Read more + recommend DA and/or the Inca Trail Trek. Discover Adventure is the best company to use when you want to explore the world easily and without worrying about anything! This trip exceeded my expectations and DA go out of their way to make everything both smooth and spectacular! Read more + anyone to do such a fantastic challenge. Amazing Peruvian experience. Fantastic leadership and organisation! I'm an old hand at charity treks and keep returning to DA as you can trust them for making it an enjoyable challenge and encouraging those who feel the strain. The whole experience from start to finish was amazing. I cannot speak highly enough of Steve as team leader, Dr Dave and all the Peak crew. They were all incredibly supportive and left nothing to chance. Second Trek with DA. Can’t wait to book another! Read more + fantastic time! And I thought I may shed a few pounds, but how can you when you are served such fabulous food? And the chef’s even dressed in their whites! Very impressed! An amazing experience that exceeded our expectations! The tour guides, porters and doctor were incredibly informative and professional. Cannot praise the team enough, superb!! Read more + reassuring. The challenge Dr, Ellen, was also excellent. Camping facilities and the local guides were fantastic, very passionate. Read more + for a fellow trekker on the hardest stretch was amazing. Could not fault him at all. He looked after the entire team, he was efficient, supportive and a real team player. An asset to DA. Definitely the best experience of my life yet!! This is the second trip I’ve done with this tour operator, and absolutely no issues. Discover Adventure may not be the biggest tour operator in the UK, but in my opinion they may be the best! A once in a life time trip and looking forward to booking with them again! Read more + was inspirational and always knew the right thing to say when we were down (or up on Dead Woman's Pass). The doc Andy was always there for when things got too much. I heard so many amazing stories and I am proud to be a part of this chapter in all of them. Rated: 5* I would thoroughly recomment Discover Adventure to anyone who wants to undertake a real challenge and receive the support and encouragement to see it through. A brilliant challenge - well organised and superbly delivered. Read more + opporunities possible. Read more + our guide Eric was superb!